Ok.. .I'm bummed!!! its 7:18 am in the morning and it's still dark outside. I've noticed... I'm much more productive the sooner it gets lighter outside! When the sun is up... I'm movin' and gettin' things done. When it's still dark outside... I'm not so fast at hoppin' to it!!! Ahhh... gives me a chance for more coffee... need a refill... BRB.... (be right back).... OK... now I'm ready to chat! 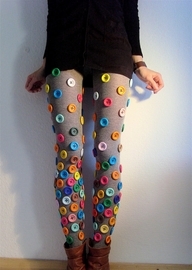 I decided today was going to be all about buttons! I'm sure you already know.. I LOVE buttons. Have no clue why! Maybe it's because we played with them when we were little... both mom and our grandmother saved buttons from old clothes... we NEVER bought buttons (that I can remember). Take a look at these sweet things! 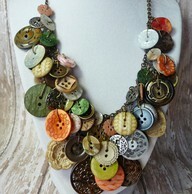 I simply love button jewelry... isn't this cute the way the used double buttons and wire? Look at that adorable hanging heart with the little bird inside! 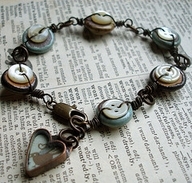 This is my bracelet... It's not the best photo... but I love my bracelet! 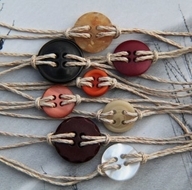 You can do the same thing... or.. use buttons like below and make a really cool necklace!! I thought this was a really cute idea... for those of you gals that knit... they made their little stitch counters out of buttons. 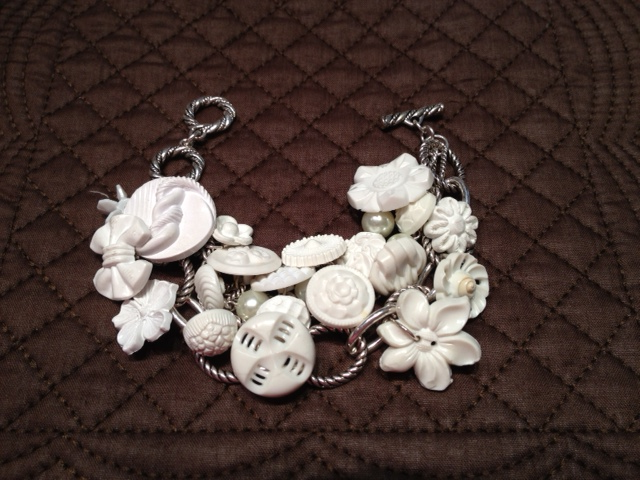 You could use pierced earring wires for this...less work and just as cute! 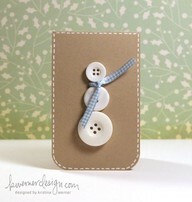 Then.. something as sweet and simple as this snowman card. How easy would this be for children to make and send as your Christmas card. I just love getting homemade cards from little ones. It truly is extra special knowing they took the time to make them for me. I keep all of them! Then.. I'm going to give them back when they get older so they will have "memories". I love making "memories"... don't you? 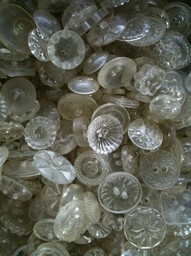 Another type of button that I think is just simply gorgeous are the GLASS buttons. WOW...do they ever sparkle under the BEST light. Guess where I've noticed how pretty jewelry looks and how wonderful it sparkles...??? You're going to laugh at me... but I'm dead serious! 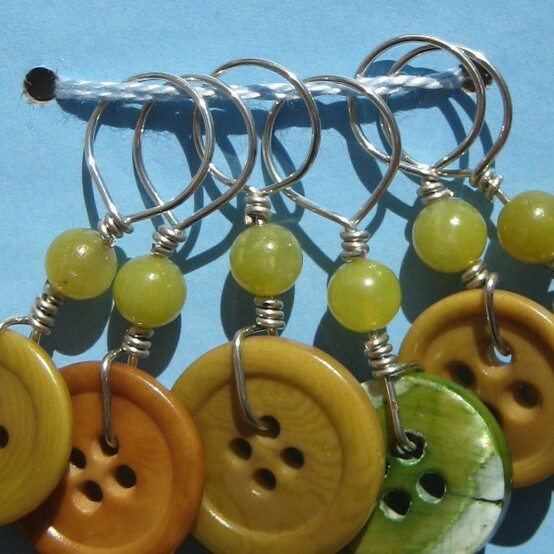 Hey... have you ever visited with the button jewelry vendors that are at the quilt shows? OH MY... I just love hearing the history about the buttons. They simply amaze me at the knowledge they have on each of these little beauties. These are the most interesting to me. They are "perfume" buttons. In the 1800's (I think it's during this time...) when the MEN did not bathe as often as they do today.. they would smell VERY RIPE! The ladies were all wearing those BIG full skirts - LONG - with the high necks... long sleeves... down to their wrists... get the picture in your mind? Well... they would make sure they had these tiny buttons at the wrists of their sleeves so they could dab perfume on them. See how it looks like velour under the metal? It was exactly that type of fabric and it would absorb the perfume. So when something "smelly" would approach them... or be on the streets (horse droppings)... they would fan their hankie and put their wrist up to their nose and take a whiff of the perfume! Isn't that so cool??? This... is the door handle from a HUGE button store in Europe! WOW.. would it ever be fun to spend the afternoon in this shop!!! I visited a HUGE button store in San Francisco (sorry...can't remember the name of it) and it was fabulous. They had (it seemed like) millions of buttons! From the smallest of prices to hundreds of dollars for each one! Then.. last but not least ... is my "funny-happy" picture of the day. But of course... it relates to buttons!! JUST SAY NO............... These surely could not be comfortable when sitting. How silly are they!! tee hee. Yea... the sun is up!! It's time for me to get busy! Have a super Tuesday and... have some FUN TODAY! !